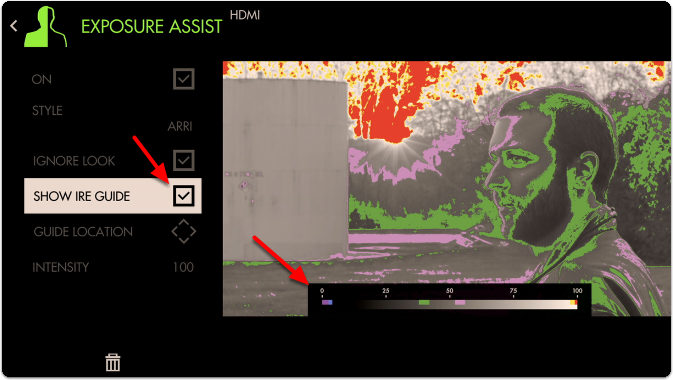 *New firmware 3.0 feature - Exposure Assist scale is now fully customizable! 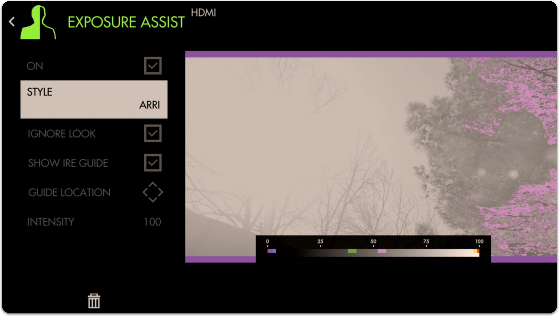 Use this section to compare Exposure Assist with SmallHD's other exposure tools to help you find what suits your personal preference. Because Exposure Assist 'paints' your image different colors depending on what their luma (brightness) value is, it can be beneficial to memorize these colors to make the most sense of your exposure range. 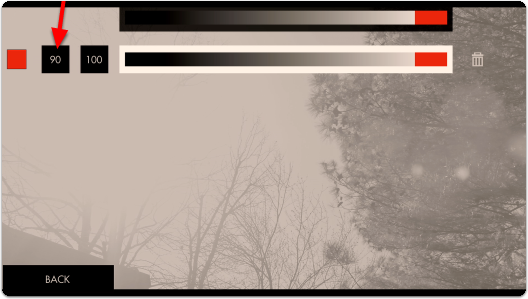 Alternately you can now create your own exposure/color scale if you find the presets not to your tastes or suitable for your camera. Exposure Assist is a very fast tool for finding proper exposure because you can simply look at your image - if a desired portion of the picture is being painted the color designated for highlights for example, that typically means you'll have to bring down the exposure to regain the detail in that area. If the colorizing effect of Exposure Assist is too distracting for your other on-set tasks, try creating a new page specifically for it so that you can flip back and forth for a quick exposure spot-check when needed. Because the Exposure Assist scale can now be customized allowing you to map many colors to many brightness ranges, it can give you an incredibly comprehensive look at your exposure values. 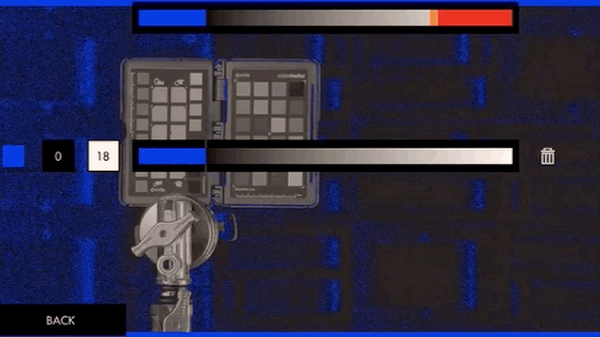 The Waveform only offers slightly more utility in that it can be used to gauge chrominance (color) in addition to luminance (exposure) when using Parade or RGB modes. If you would rather look at a graph to expose your image than to have it 'painted over', have a look at the Waveform. Because of the nature of Exposure Assist and how it paints the image various colors, it can become distracting to other necessary jobs on set. Tools like the Zebra, though less comprehensive, may work better for keeping a low profile. From any page, click the joystick or tap the screen to bring up (1) ‘Add New Tool’ and navigate to (2) Expose > (3) Exposure Assist and select to add it to the current page. Once added you can edit the settings by navigating right or tapping the right arrow when ‘Exposure assist’ is highlighted. 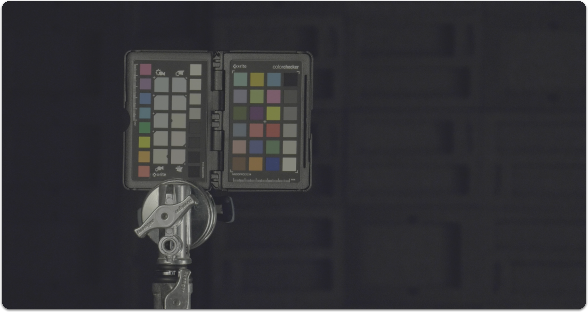 By default the Arri False Color scale is used which is a great place to start. 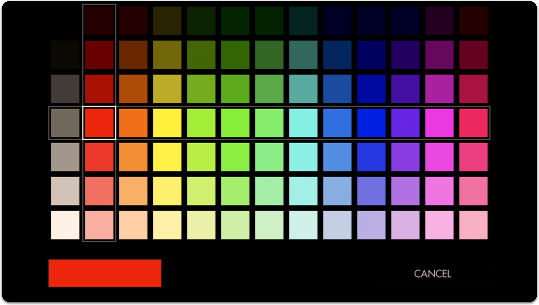 The chart below describes what each color means- essentially when an element in your scene gets colorized, that means it is within the brightness range specified here. This allows you to make exposure decisions that are based on numeric values as opposed to simply how the image appears, which depending on viewing environment and many other factors can yield inconsistent results. Enable 'SHOW IRE GUIDE' to get an on-monitor view of which values are getting mapped to the colors on the scale. Exposure values near the 50% mark on the scale will generally provide the most natural result on human skin. With the Arri scale this means the pink and green bands provide a great guide as the upper and lower range for exposing faces. 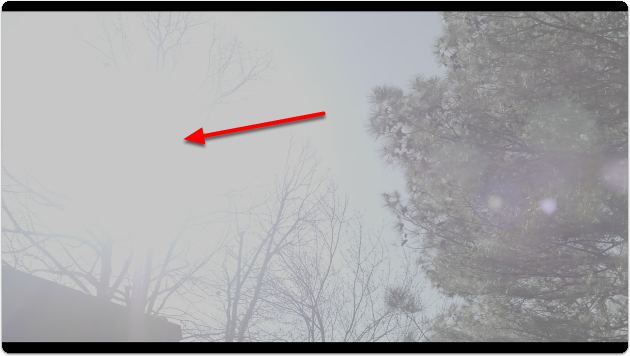 Sticking with this exposure value means we'll be clipping a portion of the sky & sun - Exposure Assist makes it clear which areas will be clipping/losing detail as a result of overexposure by painting such areas red. Clipped areas are tricky to manipulate in post production because they are effectively comprised of a single 'blob' of color/value. When graded normally, skin tones maintain plenty of detail due to being exposed in an optimal range. 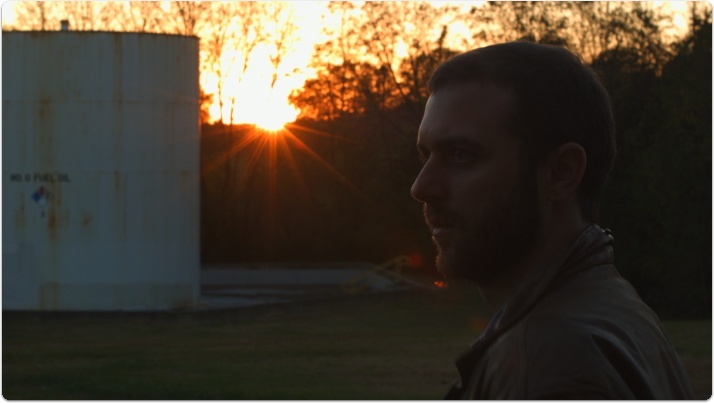 Below-left is an example of normally-exposed face, below-right is an example of an underexposed face that has been brought up in color grading - take note the difference in image noise. Exposing a shot ‘just right’ will vary greatly between shoots, operators and cameras but is always a compromise in some way. You must decide how important are your highlights and shadows and what will contribute to the better final image, and this can vary depending on many elements including intended color grade, delivery methods, VFX and of course the camera itself - some handle highlights better than shadows for example, others vice-versa. NEW with firmware version 3.0! - Continue this section to learn how to get the most out of Exposure Assist by creating your own preset. 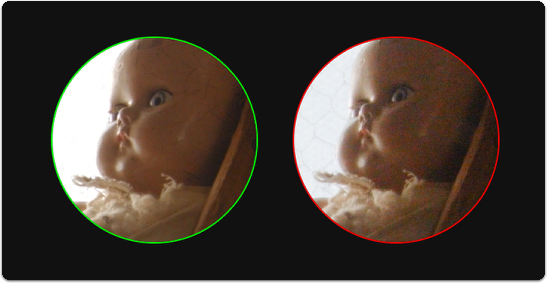 Many cameras, particularly when shooting in 'log' mode keep their brightest highlight and darkest shadow at values other than 100% and 0% respectively. Full shadow clipping might be as high as 10% and highlights might be as low as 90% for example. Customizing the Exposure Assist scale ensures these settings are tuned to your specific camera for guaranteed accuracy. To begin setting the scale we need to first find the limits. For the following example I'm using a DVX200 set to V-Log gamma but this procedure applies to any camera or gamma. Add an Exposure Assist via Add Tool > Expose > Exposure Assist if not already applied. 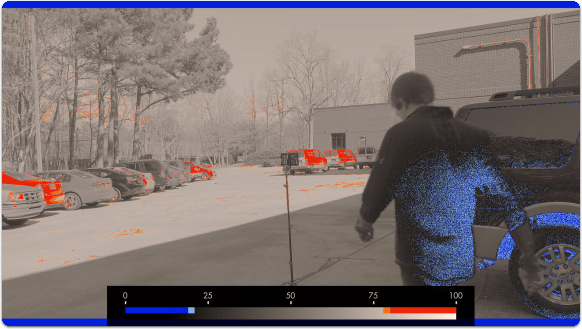 Even though the sun area is clearly clipping, the Arri false color scale doesn't pick it up - we need to fix this for an accurate reading. 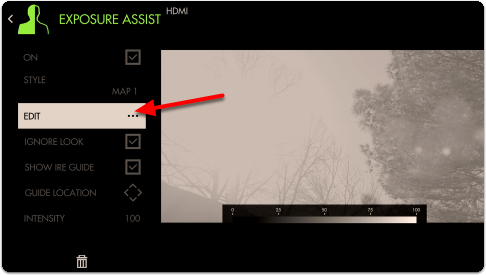 Select 'Style' and choose 'Map1' to start with an empty preset that we can modify. Let's choose red to act as an overexposure clip warning. 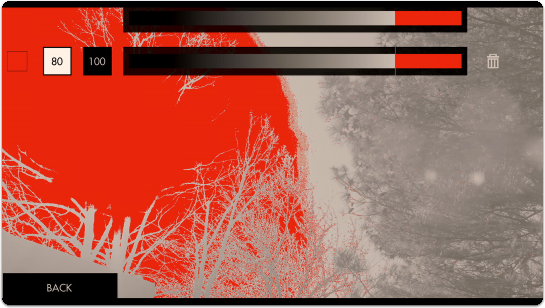 Move the color block to the far right - now any values in the 90%-100% range will get painted red. As can be seen none of the values in this image even reach 90% so we need to decrease the 'MIN' until we see a red blob appear where the sun is located. When decreased to 80%, we have finally found the limit at which this camera clips highlights. Now if you see orange it means you're almost clipping highlights and if you see red you are clipping highlights. Repeat the same process but this time to the darker extremes - I have my shot set up in a dark environment but you may simply cover the lens for this stage when looking to pinpoint the camera & gamma's native black point. Create a new color band for the shadows - I prefer 'cool' colors for dark areas and normally set highlights to 'warm' colors to help me identify each zone quickly but feel free to use any configuration that makes sense to you! Set the MIN to 0 and adjust the MAX value to the point where color starts being introduced - You can customize this value until the noise level is acceptable to you (anything that gets painted blue is considered 'clipped', so increase the MAX to 'clip' more of the noise). Because Exposure Assist is ultimately a guide, setting these ranges is for keeping us aware of issues as soon as they show up. In this case if we see a deep blue on someone's face, we'll need to increase exposure or the footage will be noisy. 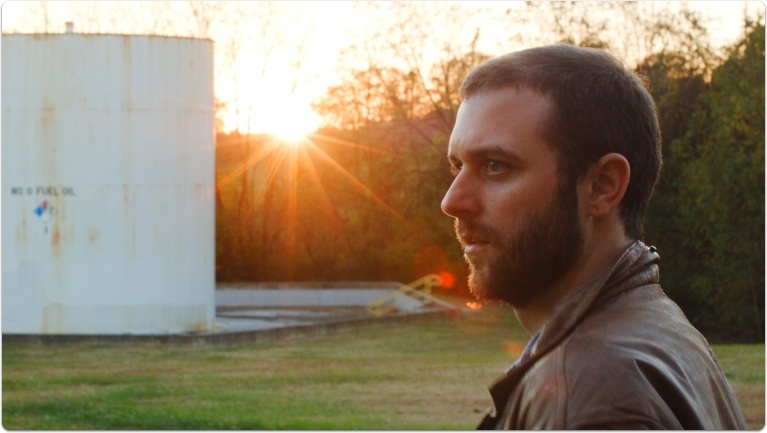 Here is what a shot looks like when we're employing the new exposure scale. The colors reveal precisely which areas are recoverable and which are lost. 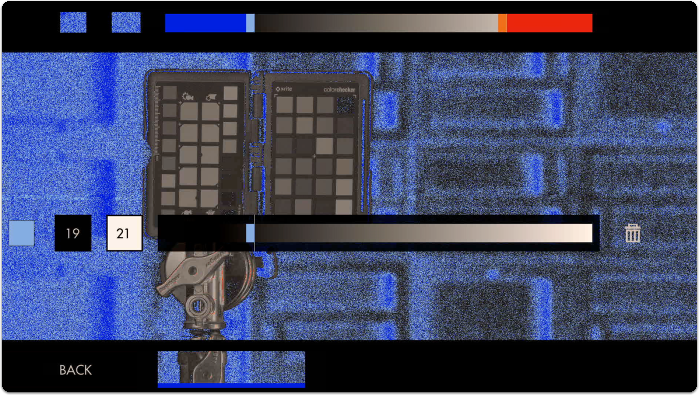 Red areas are clipped highlights, blue areas are noisy/clipped shadows. You may continue to add colors to the scale, for example a midpoint to represent skin tones or an 18% grey card/chart. Access Exposure Assist's settings menu by navigating right or pressing the right arrow when the Waveform is highlighted. 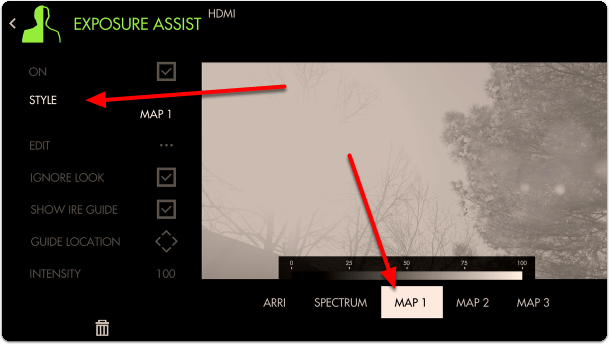 Choose from a preset exposure assist scale or start with a generic map that you can customize. 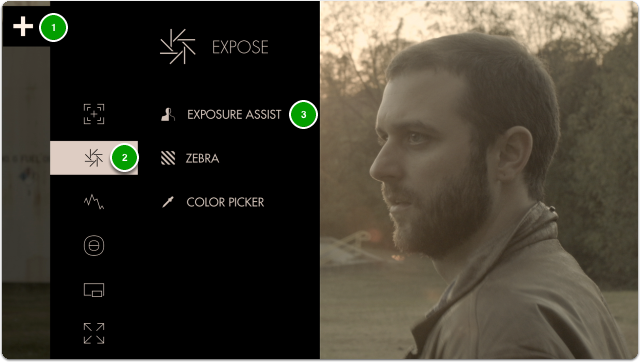 Customize the exposure scale to set any brightness value to a color of your choosing. It’s useful! Try it out! 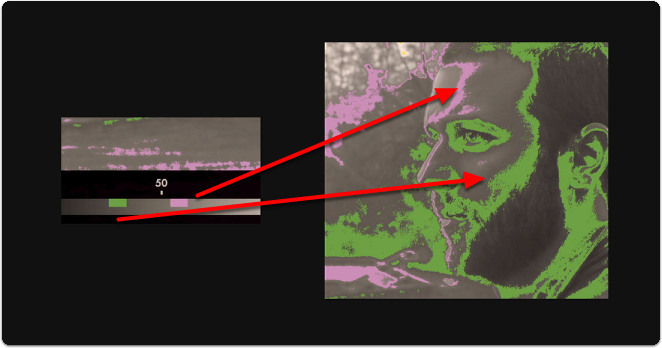 Allows Exposure Assist to work on the signal directly from the camera even if you have a Look (3D LUT) applied which would otherwise affect the results on the scale. 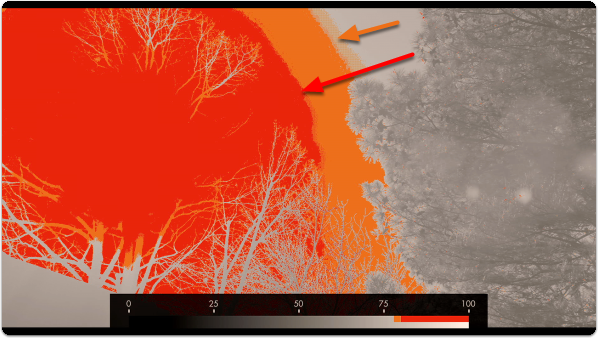 Uncheck if you wish to monitor exposure values AFTER a look has been applied to see what effect it may bring to the final image. 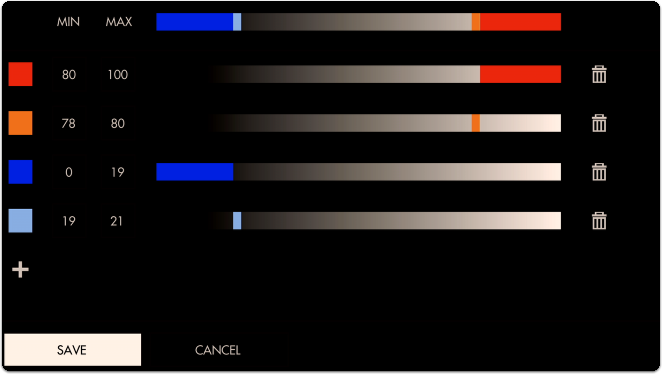 Display a visual ‘legend’ to help make sense of the colors that correspond to brightness values. Set the location of the IRE guide to a spot of your choosing. Dial in the intensity of Exposure Assist to make its effect more subtle, allowing an easier view of the original image. Dialing back the Intensity will also decrease Exposure Assist’s greyscale influence, bringing saturation back into your image.